A2 Hosting is a web hosting company based in Ann Arbor, Michigan. Founded in 2001, the company first did business as Iniquinet. Since rebranding in 2003 as "A2," this web host has grown by leaps and bounds. As the first hosting company to offer PHP7 for scripting, A2Hosting focuses on performance and affordability rather than bells and whistles. There is a good chance that you have never heard of A2 Hosting, or if you have, it is only in passing. A2 is not a huge name like Bluehost, and when you visit the site, you will notice that they are not big on free marketing credits and other bells and whistles. But A2 goes right where a lot of other companies go wrong, by emphasizing speed and performance. Uptime is incredible, and load times are ridiculously fast—close to instantaneous in many cases. HostingManual is hosted by A2 Hosting. Do you like the speed? A2 achieves this kind of reliability by limiting the number of customers on each shared hosting server. The downside of that is you have to pay a premium price. If that’s not an issue for you, it’s well worth the price and you will avoid a lot of needless headaches with the average hosting company. They put too many customers on a single server and the result is usually suboptimal. Basically, A2 does not offer a lot of “flash,” but it more than makes up for that with lightning-fast load times. These prices are only for new customers. When you renew your plan you will be charged the regular prices. You also pay a higher price if you choose monthly payment instead of the longer term yearly contract. For each type of hosting there are multiple levels of plans. If you are looking for shared hosting you can choose between the Lite, Swift, and Turbo plans. Lite is perfect if you are just starting and want to have one website online. Swift and Turbo are for sites with heavier traffic or more than one sites. For personal or small business use, most individuals can go with Shared Hosting. VPS Hosting is the next step up, providing you with the functionality of Dedicated Hosting on a shared server. Dedicated Hosting is, of course, a good deal more expensive, but it is the best choice for a large commercial enterprise. You have the option of using servers which are up to 20x faster if you choose a “Turbo” plan. 99.9% uptime guarantee. We have enjoyed 100% so far. Support for OpenCart, WordPress, Drupal, and Joomla. A2hosting the most expertise among shared hosts I have seen when it comes to hosting specialized apps. They can set you up with any of the major shopping carts or CMSs with the same levels of service (Lite, Swift, and Turbo). No matter which ecommerce platform you choose, you can get it preinstalled on your A2 Hosting plan. Slow ecommerce sites are a common issue. I am asked to speed up shop sites almost every day. With A2, a snappy ecommerce experience comes out of the box. You have the option to install Magento, Prestashop and integrate PayPal through single-click setup. You can then select payment methods, create shipping profiles, choose languages and currencies, and create your product listings. As you have your choice of shopping carts, you can quickly install and set up a solution which works for your needs. Even at the Lite level with a cheap Shared Hosting account, A2Hosting provides you with unlimited storage and transfer. This means that you can stock as many products as you need to in your shop, and you will not need to worry about extra charges if you have high traffic during the holidays or other key retail seasons. 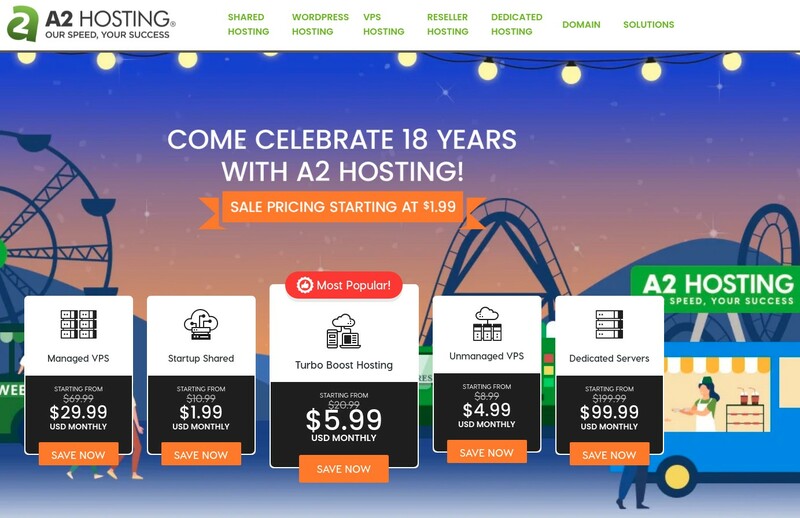 Judging by customer reviews, A2 Hosting is not the most popular choice for eCommerce but does provide you with the flexibility, speed, and reliability you need to host an online store. In fact, it should probably be a much more popular choice and likely is not for the sole reason that many people are not aware of its existence. Amazing uptime and load times keep customers on your site. That means more sales, and that is what A2 can offer you. KernelCare is a software extension which enhances kernel security for Linux on A2 Hosting servers. This extension works continuously to fortify the kernel with the latest security updates. This takes place automatically without the need to reboot. HackScan, the other Perpetual Security feature included in your account, is a free malware protection service. It turns 24/7 to block attacks. If your site does manage to get hacked, A2 provides an extensive guide to help you secure your site again and prevent attacks in the future. To prevent DDoS attacks, you can set up A2 to use CloudFlare, but you need to do this manually using cPanel or by signing up on CloudFlare’s website. A2 Hosting also provides you with tools for managing spam in cPanel, as well as preventing your outgoing emails from being marked as spam. So in terms of security, A2 Hosting is quite robust; in particular, KernelCare provides a strong core to the company’s security features. But there are many features (like CloudFlare) which you are responsible for manually integrating and maintaining yourself. A2’s security guides can walk you through all of this. If for whatever reason you are not satisfied with A2 Hosting, you can submit a request for a full refund within the first 30 days of service. You can only get a refund on the cost of the hosting itself; you can not receive a refund for setup or migration fees or domain registrations. You can, however, get a refund for an SSL certificate if you apply for one within 7 days of purchase. A2Hosting scores great marks for ease of use and customer onboarding, which starts with a welcome email sent minutes after you complete your order for services. A lot of other companies just provide you with a link to their site and no instructions, but A2 Hosting provides you with information on your plan, account, DNS, FTP, email, and more. You can have your first site up and running within just a few minutes. Your account includes the latest version of cPanel which is optimized to A2. Through cPanel, you can view information on your site and carry out a variety of administrative tasks. Even if you have very little experience (or are a complete greenhorn) with website administration, you should be able to find your way around pretty quickly. Needless to say that each plan comes with Softaculous 1-Click install for virtually anything open-source. If you are an advanced webmaster, you will find the cPanel easy to use, but not overly simplistic or basic; there are plenty of advanced features available. You can, for example, create a private nameserver or modify the A-records. While customer service may not be the first feature you consider when you look into a new web host, it should be one of your top priorities. A2’s fast and reliable service means you are unlikely to encounter downtime, but it is pretty much a guarantee you will need help with something sooner or later. When you do, you need customer service to be there for you. A2Hosting allows you to search for solutions in their knowledge base or hosting blog. But you also have the option of submitting a support ticket, speaking to an agent on the phone, or contacting a representative through Skype or live chat directly on the website. Some hosts restrict you to only a couple of communication channels, so it is great that all these options are available. I usually have to wait about two minutes for an agent to staff the chat line. It takes several more minutes for the agent to answer my questions, but when they do, the response is thorough and knowledgeable. The agents are friendly and polite, and I am very satisfied with the service. I feel confident working through an issue with this team as a customer. Sometimes the live chat gets a bit overloaded, but they still take care of support tickets in a timely manner. Who is A2 Hosting Best For? If you are looking for a lot of flashy features and bells and whistles, A2 is not going to give you what you need. But if you want something which provides you with a robust core of essential features and unrivaled reliability and speed, A2 is a choice you cannot beat. This makes it a fantastic choice for both business and personal use. Claims of 99.9% uptime are pretty much ubiquitous among web hosts, but not all hosts actually deliver. A2 is serious about providing you with 99.9% uptime. I cannot remember even a brief downtime since hostingmanual.net is hosted with them. Customers I work with who have used A2 Hosting for years have also reported a downtime-free experience. You are going to be hard-pressed to find faster servers anywhere. This is where all reviews agree: you can say goodbye to slow load times and resulting high bounce rates. The “Turbo” plan delivers the highest speeds, but you will get fantastic speeds even with the “Lite” or “Swift” plans. Automatic kernel updates, HackScan, and spam management features for email are effective security tools to keep your website virus-free, safe, fast, and functional. Many web hosts are sorely lacking when it comes to onboarding. When you get started with A2, even if you are a complete newbie, you should find that the resources provided will ease your transition into website administration. A2 Hosting’s cPanel is easy for beginners to use, but still, offers plenty of advanced functionality for experts. So wherever you fall in terms of experience, you should find A2 very accessible. One-click integration for Magento and Prestashop along with pre-installed OpenCart make it a breeze to get started selling online. Fast load times, unlimited bandwidth and true 99.9% uptime keep customers on your site, ready to spend money. If you need help, A2’s knowledgeable team is standing by, ready to assist you 24/7. Wait times are short, and agents will work with you to make sure you have thorough answers to your questions. It is hard to come up with a lot of cons for A2Hosting, but this host will cost you more than some competing services. If you are on a very tight budget, it may not be ideal. A2 Hosting may not be as well-known as some of the bigger names in hosting, but this company deserves acclaim for its streamlined, powerful hosting solutions. Pricing may be higher than it is at competing hosts, but this is only because A2 is allocating shared server space between fewer customers. This means that more resources are available to each individual customer, resulting in lightning-fast speeds and outstanding uptime. That is why we can give A2 Hosting a top recommendation to large and small businesses as well as individuals looking to host personal sites. A2 easily blows most of its competitors out of the water. Right now they are offering some fabulous discounts (51% Off), so take it while it lasts. Disclosure: I am an affiliate of A2Hosting and I get a commission when you click a link and purchase hosting. That’s how I maintain this website. It doesn’t cost you anything. In fact, I guarantee you get the best price when you use my link. I have rated A2Hosting 4 out of 5. A2Hosting is in the top 3 of my reviewed web hosts. This is the fastest web host we have dealt with. The price is a bit high but Turbo is unbeatable. Looking for A2Hosting alternatives? Check out Bluehost.